I’m in a perpetual search of the best foot massage. I’ve tried physical therapy myself, and I talked with various chiropractors about the devices they recommend and the techniques they use. I’ve visited a few stores and showrooms to try and test different massagers. I’ve bought a few of them myself and had my team test them during organized focus groups. I’ve read countless reviews and spent a lot of time on forums. At least until I get a hand on newer and better, I will have to rethink everything. But, until then, I have for you the best foot massagers to date. They aim to relieve pain and relax you, but they’re all suited for different purposes. 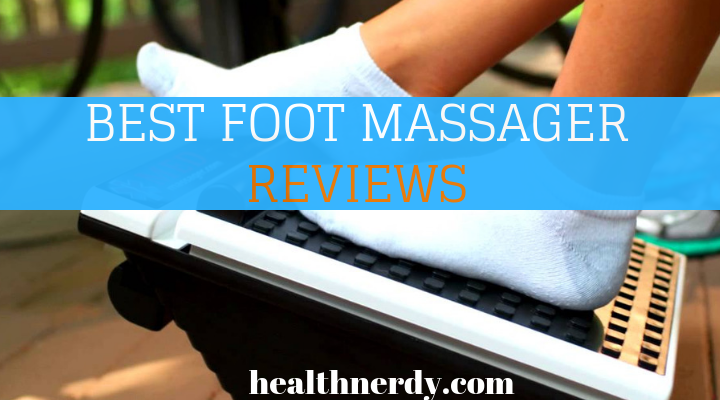 I’ll list all my reviews below, answer your most ardent questions in the FAQ section, plus add a short buying guide with the factors you need to take into account before buying a foot massager. #1 MedMassager MMF06 11 Speed Foot Massager! 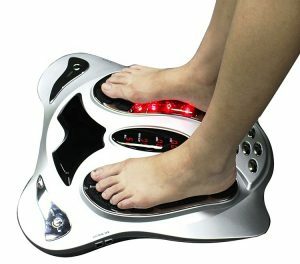 Do Foot Massagers Improve Circulation? Should People With Diabetes Get Foot Massages? Can Foot Massage Help Neuropathy? How Often Should I Use My Foot, Massager? 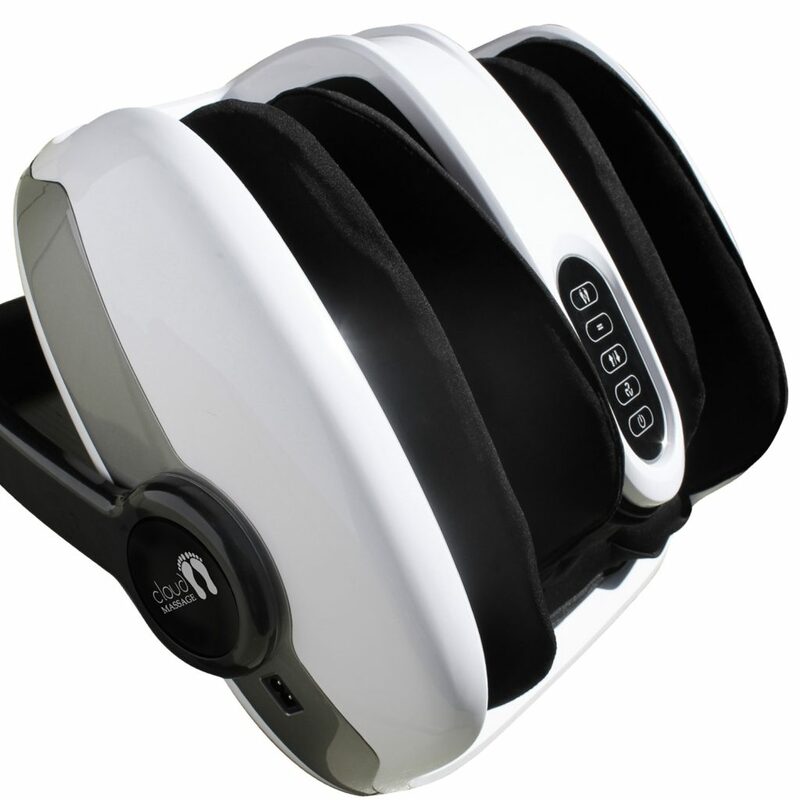 If I have to choose one model that will make a difference, it would be MedMassager 11 Speed Foot Massager! But all the models below have their positives. 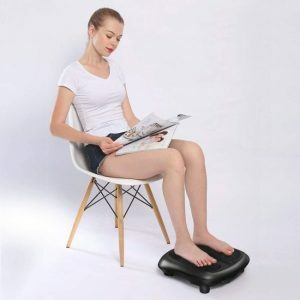 While MedMassager is the most versatile of the batch, some of the massagers below are best for deep kneading, others for Shiatsu, while others are amazing when it comes to plantar fasciitis pain. MedMassager is a therapeutic, medically approved massager. Endorsed by plenty of physical therapists and MDs, MedMassager is recommended to help with diabetes or neuropathy pain. That’s because it improves blood circulation (great type of massagers for circulation improvement) and unwinds muscle soreness, therefore alleviating any pressure in the area and allowing you to regain your mobility. I appreciate functional, versatile and reliable devices, and MedMassager is known as today’s most powerful massager. With 11 speeds, the motor rotates quickly, between 1000 to 37000 rpm. 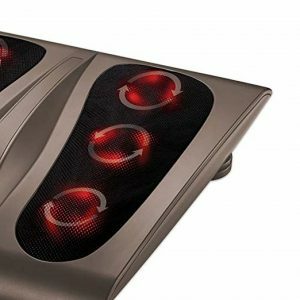 This powerful motor makes the MMF06 highly efficient, allowing you to enjoy a satisfying massage for your achy feet. Besides, this is a sturdy, resistant unit. It’s not just me saying it – it’s the 12-month replacement warranty against all failures and defects. The MMF06 has an ergonomic design, it’s easy to use, and it’s safe. 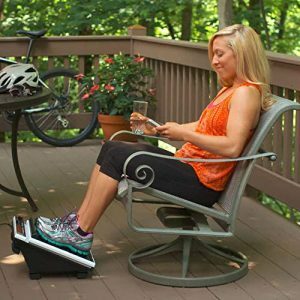 The user-friendly pad slants are inclined at a comfortable angle, so you can relax while having this foot massage. The package includes a kit so you can use the massager on various floor types, like tile or hardwood without slipping. 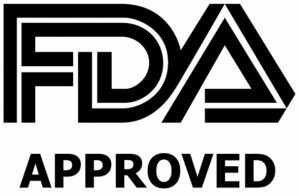 As I want the products I use and recommend others to be extremely safe, I’m glad that the MMF06 respects all the ISO 9000-2001 standards and it’s FDA-certified for therapeutic use. With so many things I said about MMF06, you would say it’s a perfect massager. But I do have a couple of complaints. First – the price. But, I understand you have to pay for quality. Secondly, it’s a bit noisy, but that doesn’t affect its functionality. Third – and this is a big one – the MMF06 has a foot pad design, with a pressure point targeting surface and a bar to massage your arch. So it’s not an enveloping design that would massage your forefoot as well. Summary: The MMF06 is a powerful, versatile therapeutic massager. Cloud Massage model is my second choice. It designed to provide superior shiatsu massage. The first thing you notice when you look at it is its partly enveloping design. While this leaves the forefoot out in the open, it can massage the sides of your feet, which means you’ll get an almost complete massage. It is great for people with large feet. You can also place this massager upright and massage the back and sides of your calves. Which brings me to my point: this is the best calf massager I could find. Its deep kneading Shiatsu technique provides quick relief because it gets rid of painful knots. The massage is of high quality, using heat therapy, air compression, and vibrations. These techniques help improve blood circulation, reduce swelling and unwind muscle soreness. While this makes it a reliable therapeutic chair, the MMF06 features a more powerful massage, which is what ranks it first. As it is, the Cloud Massager wins an honorable second place. But it’s a worthwhile product, with a 100% no-hassle warranty. The easy-adjustable bar is a plus. The inclined design is impressive – you won’t be forced to sit up straight and stiff in a chair. You can lean back, with your legs at a natural angle, so you can relax while being massaged. The only two things I dislike about this massager are the open-toe design and the price. But if you think about it, the open toe design has its perks: you can use this massager even if you have big feet. Still, the 5x11 inches massage area is wide, and I like that I could adjust the massage intensity levels. I started with the lowest intensity level first so I can ease into a more vigorous massage. Summary: The Cloud Massage Shiatsu massager is costly but versatile and effective against calf pain. 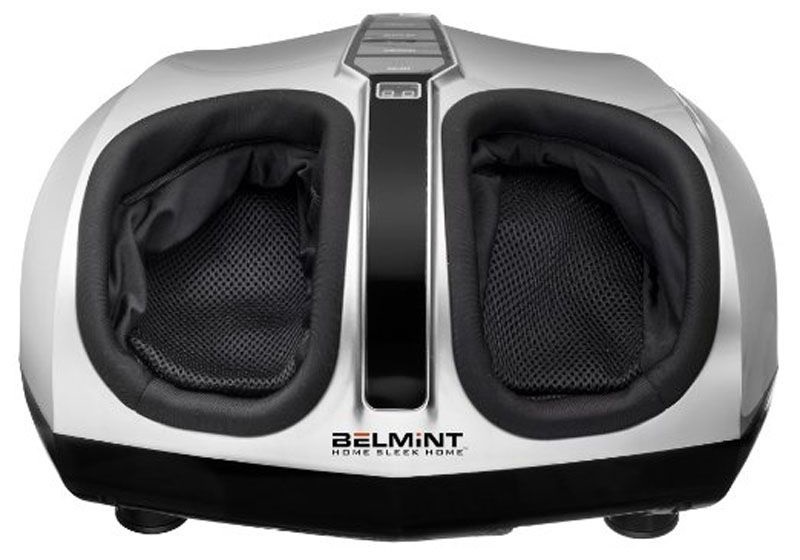 The Belmint Shiatsu massager is advertised as deep kneading – and boy, does it knead deep! If you have heel pain, heel spurs or plantar fasciitis, you’ll love how easy it is to disperse chronic pain or nerve pain. 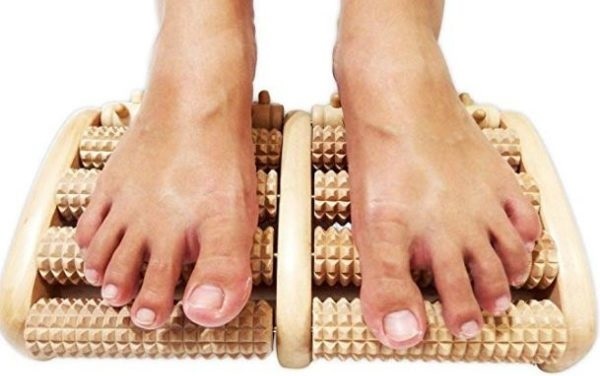 This Belmint foot massager will become your therapist, at an affordable price. Its control panel located at the top, and you has to be adjust it manually as it doesn’t include a remote control. The heat function is therapeutic, warming up your feet so that the muscles can unwind faster. Your blood circulation is well improved, which minimizes swelling and reduces pain. I also liked the ergonomic design, even though it’s an open-design. But the unique curvature is good for people with flat feet. However, I’m not sure if you can use this for your calves. The massage area is split into six segments, three per foot, with three nodes each. These nodes revolve in opposite directions, to massage your acupuncture points. Besides, the massage nodes respect the Shiatsu technique principles, which means you’ll benefit from a very relaxing massage. As such, this massager works well for relaxation and mild pain, but it won’t provide vigorous massages. This Belmint unit is easy to use, with just one single button for one-touch operation. You can press this button with your foot instead of leaning down to turn the Belmint on or off. There’s a disadvantage here, though: you’re not getting intensity or speed adjustments. 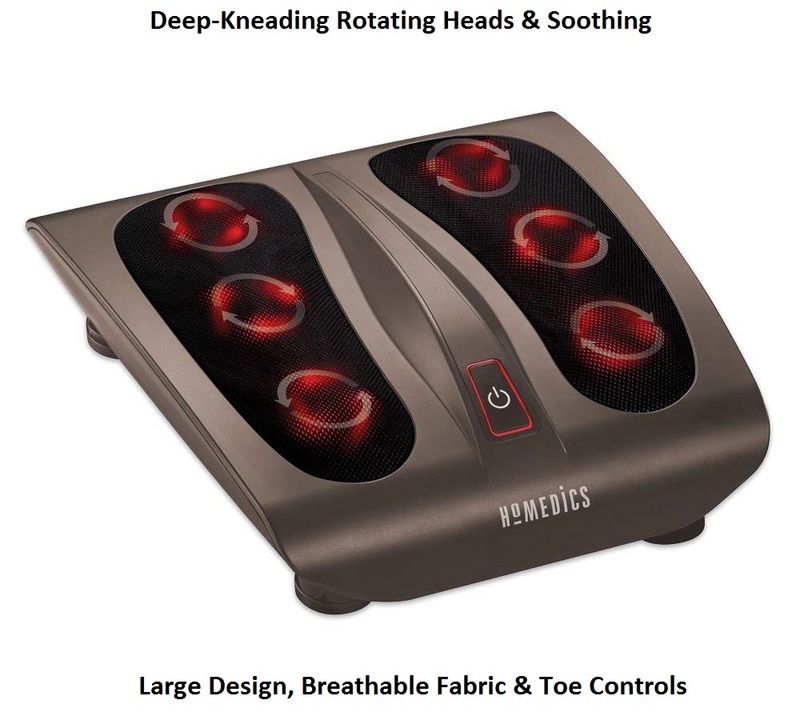 Summary: The Belmint Shiatsu feet massager offers a deep-kneading massage for plantar fasciitis, though it doesn’t allow speed or intensity level adjustments. This deep-kneading Triple Action Shiatsu Foot Massager is advertised as perfect for tired arches and soles. I couldn’t feel its healing effects too much because the 18 rotating heads feel more like tingling. To achieve a deep tissue massage, you need to press down on the massager with your feet. When you turn the heat on, the massage becomes better. Heat relaxed my tired feet almost instantly, and it felt soothing to my achy feet. Besides, heat therapy stimulates circulation, so it can work well to reduce swelling. If you’re worried about overheating, don’t. The Homedics unit has a breathable fabric that protects your feet. The ergonomic, user-friendly design is another thing I appreciate about the Homedics Foot massager. 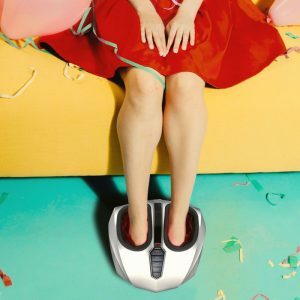 Its large platform can accommodate any shoe size, but, unfortunately, you can’t use this unit for calf massage. Otherwise, the massager is easy to use because you can press the controls with your toe. Still, there aren’t too many options or adjustments to choose. 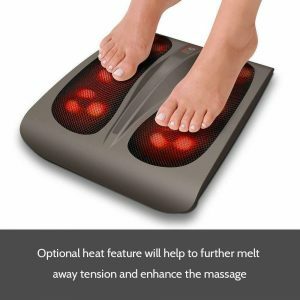 You can simply turn the heat on or off and turn the foot massage machine on or off. Summary: The Homedics unit offers a relaxing massage experience, but it’s not a therapeutic massager. This manual massager is a reliable budget option and can fight against plantar fasciitis pain. You can touch all your acupressure points easily with this manual massager, which in turn improves circulation of blood and releases painful knots. At such an affordable price, you also benefit from a lifetime guarantee. That’s because the TheraFLow massager is manufactured from polished Theaceae wood, which is a durable material. But when I took it out of the box, it smelt pretty strong. This manual massager offers good relief and is versatile enough to use it on your whole body. However, it doesn’t have all the bells and whistles of an electric foot massager, like heat or vibration. 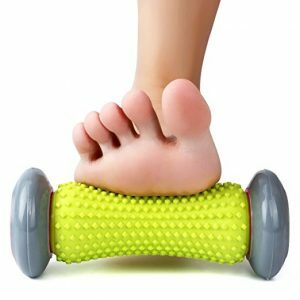 My conclusion is that the TheraFlow massager is an inexpensive massager that’s perfect for runners, but not for people with ticklish feet. 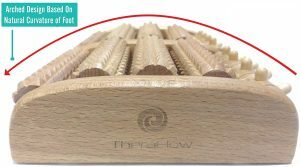 Summary: The TheraFlow Dual Foot Massage Roller is the best top manual massager thanks to its ability to touch acupuncture points and improve blood circulation. 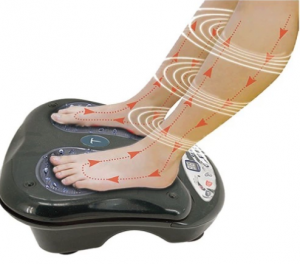 The Miko Shiatsu Foot Massager is genuinely the best shiatsu foot massager because the shiatsu nodes are strong and offer a powerful massage. It alleviates arch pain, removes bunions and relief muscle soreness. It can even ease plantar fasciitis pain, especially if you combine Shiatsu with the air massage. 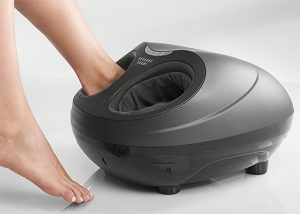 The Miko foot massager has various other functions, including kneading, rolling, vibrating and heat therapy. It can target very accurate pressure points, and it feels very lifelike. I liked the pressure adjustments because I could select the massage intensity. This massager can stabilize your foot and heels if you have the right foot size. As it is, it doesn’t target the heels of people with large feet, though it provides a terrific deep kneading arch massage for everyone. This arch massage is perfect for plantar fasciitis. Other features I liked about this massager are its intuitive center control panel with soft-touch buttons, its portability, and compact size. It even has a heating feature to relax you and help unwind sore muscles, but the temperature isn’t as hot as I would’ve liked. Summary: The Miko Shiatsu massager comes with deep-kneading Shiatsu nodes that offer a therapeutic massage experience, especially when you add air pressure and soothing heat to the mix. Nekteck massager is a reliable choice if you’re on a budget. Though it doesn’t have all the bells and whistles of a more expensive massager, it’s functional and quality. This massager features six massage heads and 18 massage nodes, meaning it will touch all your pressure points. In turn, this releases tension and helps sore feet relax. The heat therapy it features can further unwind achy muscles and improve blood circulation. My biggest complaint is its open design – no surprise there – because it can only target your soles. However, it’s an excellent arch and sole massager for runners or people who have been standing all day long. But if you want to relieve chronic foot pain, you need a massager that targets your Achilles’ tendon and your metatarsal bones. Another feature I liked about this Nekteck is its easy customization, with three adjustable heights. The massager is easy to use, and it’s portable. However, it’s better suited for people with flat feet, not with very high arches. Another frequent complaint is that its Shiatsu massage is very vigorous, so hobbyist users are warned! It would have been better if you could adjust the massage intensity, but remember its affordable price. 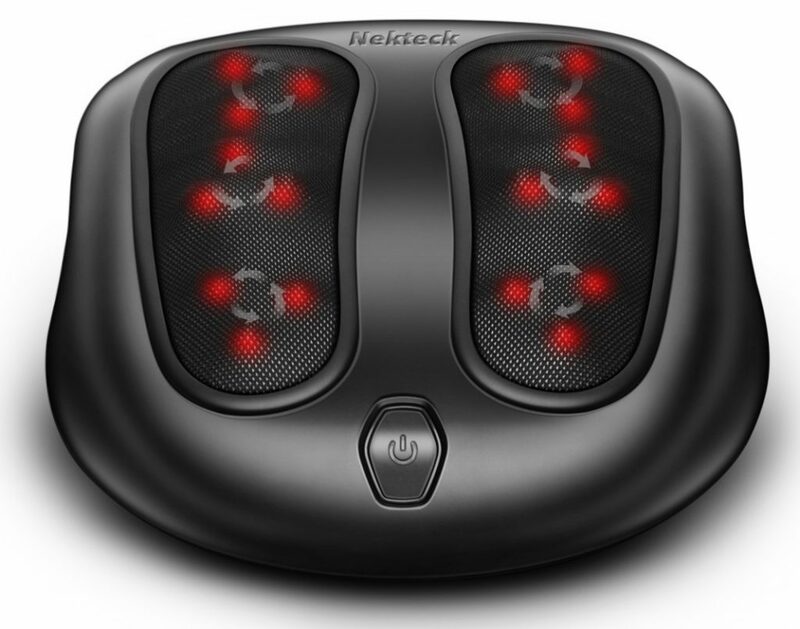 Summary: The Nekteck Foot Massager is a powerful massager, although its massages can be too rough for hobbyist users. 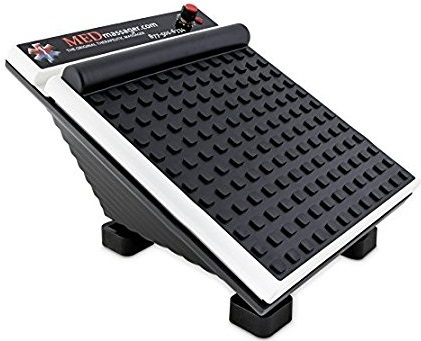 This unit offers a deep massage, so it’s excellent for bunions and plantar fasciitis. It was amazing how quickly my pain went away, even after a long day hiking. But I could also adjust the massage intensity so that I could get a milder massage for relaxation. Either way, the rolling foot pressure is especially effective when it’s combined with the air pressure. I appreciate the three massage modes and three intensity levels. Still, some users complain that even the lowest intensity is a bit too much for them. No pain no gain, right? Another frequent complaint comes from people with size 13+, whose feet feel crammed inside this massager. The TruMedic foot massager comes with a 90-day full money back guarantee. 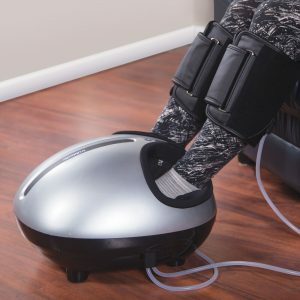 This unit uses the Shiatsu principles of applying pressure, and the soothing heat can relax you and unwind sore muscles, not to mention it’s effective against bunions. I also liked how compact, portable and easy to use the TruMedic massager is. I took it to my office; I used it while enjoying my favorite show and got immediate tension relief. However, you need a wall socket nearby. Another user-friendly addition, the calves air compression sleeves are easy to use and release tension. On the downside, you can’t get a Shiatsu massage on your calves, which would have been better to alleviate pain and improve blood flow. Summary: InstaShiatsu from TruMedic isn’t extremely affordable, but it’s effective against plantar fasciitis and bunions. This massager is useful for soothing tired feet. There are 18 nodes distributed onto six massage heads to mimic a Shiatsu massage. This massage touches all your pressure points to release tension, not to mention it’s relatively deep. Besides, the reflexology foot massage uses powerful kneading, which has important therapeutic benefits of foot massage, especially for reducing arch pain. However, some customers say they haven’t seen any improvements for chronic pain, although this unit helped them relax. You can adjust the speed on two levels, but some customers still complain about the massage which feels too vigorous. The best news is that you can make these adjustments with just your foot, without bending down. You can also adjust the height with twisting pegs, which customizes your massage experience. The heat function is another plus because it’s relaxing. In theory, therapeutic heat improves blood circulation and unwinds sore muscles, which is perfect for achy feet after hiking, running or standing all day long. However, Beurer’s temperature is just lukewarm, so it’s more on the relaxing side rather than highly therapeutic. 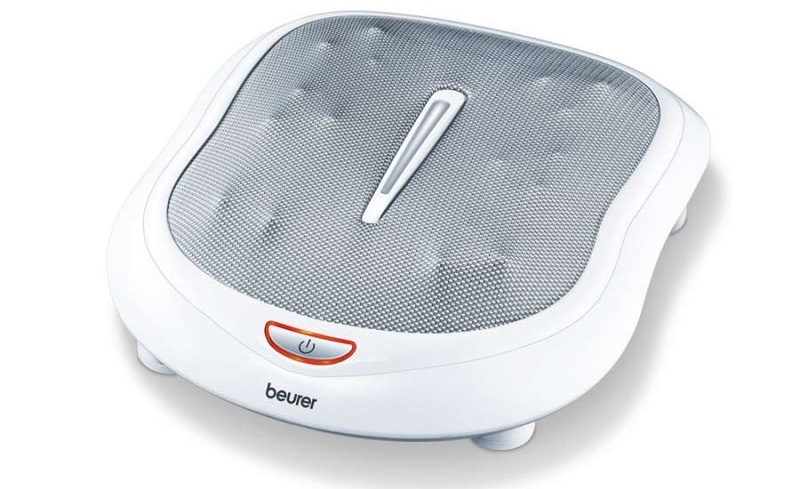 Summary: The Beurer is a functional massager with powerful Shiatsu nodes, but it’s not ideal against chronic pain. Although this massager features some positive reviews and has over four stars on Amazon, there are lots of complaints regarding it. The massage is too vigorous for most people. If you read my other articles, you know I appreciate robust massages that touch all my pressure points and release painful knots. But the F4 can hurt your feet if you’re not used to deep tissue massages, causing bruises. Otherwise, the company advertises this as soothing and refreshing to achy feet. The Shiatsu nods offer a deep-kneading massage for muscle tightness, but I wore three pairs of wool socks to make sure it wouldn’t hurt me. The F4 features three massage programs called Soothe, Pulse and Energize so you can choose your own massage experience. The compression massage with airbags is there to eliminate muscle tension, and I liked this feature. The heat works well too, it’s relaxing, and it helped with my swollen fit. In terms of design, this unit is compact, easy to move and so you can use it anywhere. However, it doesn’t fit people with big feet. Summary: The Brookstone Shiatsu F4 has plenty of functions, but its massages are borderline painful. Manual foot massagers are sturdy and reliable. They’re safe, and they can’t short-circuit. If they’re made from a durable material like quality wood or plastic, they can’t break. That’s why most of the quality manual massagers come with a lifetime guarantee. The bonus is that you can massage your whole body with them. It’s easy to adjust the intensity settings by just pressing harder. The disadvantage here is that you need to be flexible and have a decent amount of strength. You can’t unwind and let the massager do its job. That’s why manual massagers are better for people with active lifestyles who are on a budget. Otherwise, manual massagers lack therapeutic features like heat, vibrations or Shiatsu nodes. 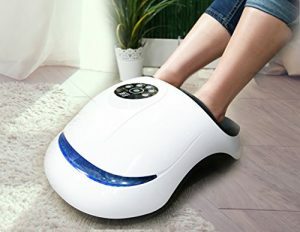 Electric foot massager bring all the advantages that manual massagers lack, from soothing heat to vibrations and the opportunity for you to enjoy a relaxing massage. You can place them under your desk while working or enjoy a TV show. The downside is that electric massagers don’t have a lifetime guarantee. There are different types of electric massagers too. Handheld devices are versatile, and you can use them on your entire body, but they have a narrow massage area. Open-toe design massagers usually have vibrating nodes and heat therapy. Some of them can be used for your calves too if you place them upright. Others come with calf sleeves, but these usually don’t have shiatsu nodes. While open-toe massagers can provide relief from arch pain and diabetes pain when you’re using them on your calves, they don’t massage your forefoot. On the other hand, plantar fasciitis massages require a total foot massage, including your Achilles’ tendons and your metatarsal bones. Closed-toe design massagers envelop your whole foot, massaging it thoroughly. They include your ankles and your forefeet as well. Most of these provide therapeutic heat, which relaxes you, improves blood circulation and unwinds sore muscles. However, these can’t be used for your calves, unless they have an included calf sleeve, so they’re not the best massagers for diabetics. Shiatsu foot massagers are the most recommended for treating plantar fasciitis because the Shiatsu nodes provide a deep-kneading massage for pain relief. If your device offers additional compression massage and therapeutic heat, you have a winner. Select from the kind of massagers above according to your purpose. Manual massagers are better for active people. Electric, open-design massagers are best for chronic pain and achy feet after being on your feet all day. Closed-design massagers are best for plantar fasciitis and relaxing experience. Heat therapy reduces swelling, promotes healthy blood flow, reduces bunions and unwinds sore muscles. Make sure the heat isn’t just lukewarm if you want maximum therapeutic results. A low-temperature heat is better for relaxation, though. Air massages are relaxing and feel very life-like. They aim to heal compressed blood vessels, improving blood circulation. Air compressions are excellent for getting rid of calf cramps or blood clots. Vibrations unwind sore muscles and are effective against painful knots. Vibrations reduce clots in your calves and improve blood flow. This type of massage is soothing and works against achy feet, especially if you’ve been hiking, dancing or doing high-impact activities. These nodes offer a deep tissue massage, which relieves pain almost instantly. Shiatsu nodes are relaxing, but they should be a top issue to consider if you want chronic pain relief. Look for useful extras like support for different types of floors, changeable massage heads, a carry pouch or a long cord. Depending on your needs, you want to use the massager on various parts of your body. Manual rollers and handheld devices are the most versatile massagers. 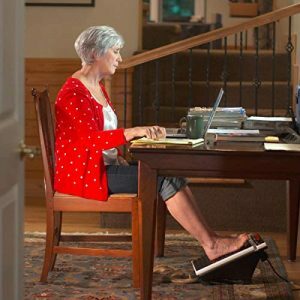 If you want an electric massager for your feet, make sure you can also use it on your calves. 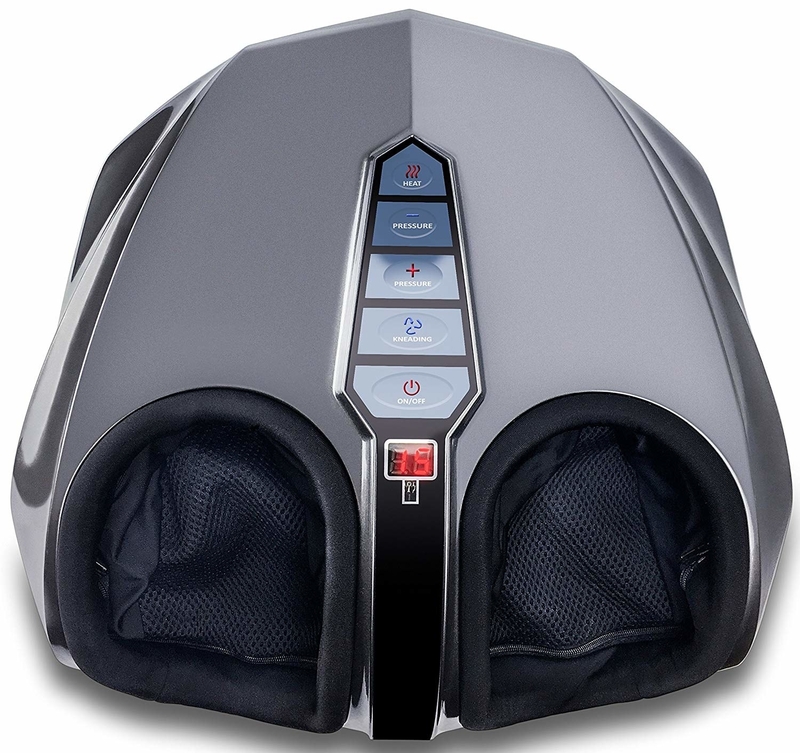 Make sure you can comfortably squeeze your feet into the massager if you opt for a closed design. If you choose an open-design and you have small feet, make sure the unit targets your heels as well. Generally, safe massagers have a better warranty. The best massagers have an FDA approval and are recommended by physical trainers and doctors. If your budget is small, you can opt for a manual massager or affordable but basic electric massagers. You can also hunt online promotions and discounts or buy a used unit. Investing in a more expensive massager has its perks too because you’re investing in your health. Physical therapy sessions for a year are way more expensive than a quality massager. Yes. Even a basic manual massager reduces swelling and can, therefore, improve blood circulation. Additional features like heat therapy widen the veins to promote healthy blood flow. Vibrations and air compression reduce swelling as well. Yes, many doctors and physical therapists recommend foot massages to people with diabetes. These massages reduce swelling and any associated pain so that you can enjoy a more active, pain-free lifestyle. Yes., It can help. Neuropathy means damaged peripheral nerves, so it’s important to improve blood flow to affected areas. Shiatsu foot massagers offer a deep-tissue massage to improve circulation and bring more oxygen to the nerves in your feet. Start with once a day, for 10 minutes. The rule of thumb is that you should stop when you feel any pain. Otherwise, you can enjoy a low to moderate massage for as long as you like each day. Vigorous, deep tissue massages should only be performed once per day. Read the instruction manual for additional info. The best places to buy a quality foot massager on sale (with the discount compared to directly or in physical store near you) are Amazon. Limited models a Also available at Walmart, Target and Meijer, Kohl's, Best Buy. Some offline stores allow you to test their product and compare different models. Amazon has an excellent policy regarding shipping and returns, plus you can get some used models too for a significant discount. 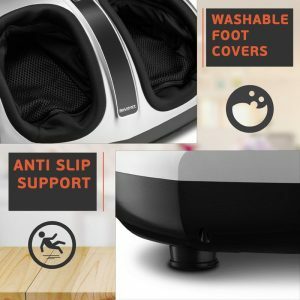 I’ve taken you through a series of best foot massagers, discussed the different types of massagers, plus the most important features on how to select a quality home foot massager. Hopefully, I’ve answered all your questions so you can compare, contrast and make an informed decision. That said, MedMassager MMF06 is my top choice. 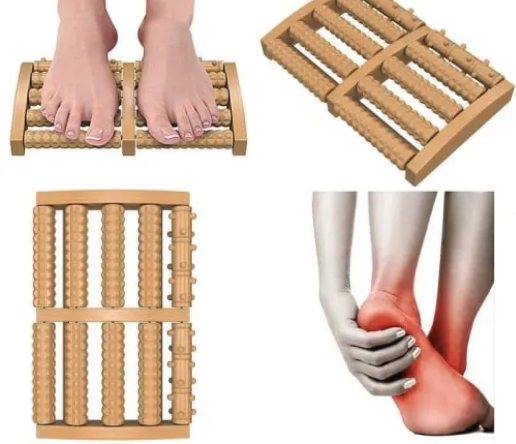 It’s versatile, it’s endorsed by medics and physical therapists as a therapeutic device, it can treat chronic diabetes/ neuropathy pain, and it has a powerful motor. However, the best model for plantar fasciitis is InstaShiatsu from TruMedic thanks to its mix of massage techniques: deep tissue Shiatsu, air compression, and heat therapy. The best calf massager award goes to Cloud Massage Foot and Calf Shiatsu Massager! 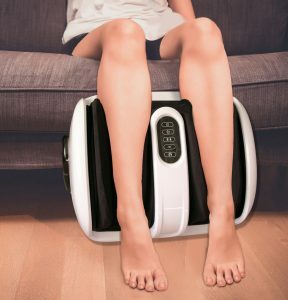 This massager throws all its weapons at a tired, achy, swollen calves, from air massage, heat therapy, to vibrations and Shiatsu. All these techniques improve blood circulation and unwind sore muscles. This review did not include any foot spa models!